Celeste Susany was born in a small town in eastern Ohio in 1952. Then, in 1962, moved to Southern California with her family. She spent her formative years as a young artist amid the pageantry of Santa Anita, Hollywood Park and Del Mar. 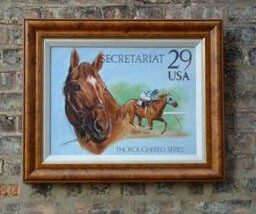 Thoroughbred racing, along with her artistic eye, were the right combination to bring to life on canvas a love of a sport that has lasted close to three decades. Celeste received her degree from Art Center College of Design, Los Angeles. While still at school, she describes an occasional exit out the back curtain of her perspective class to go to the track, as part of her education. After graduation, she became an art director for a large record distributing company. All the while, continuing to do sketches of the horses and landscapes at the racetrack. Her real education came as a hotwalker at Santa Anita. Because she wasn’t brought up around horses, she felt the need to be up close and personal by taking a job on the backside. Although her hotwalking days were short-lived, (because she felt the need to stay alive) it gave her a different perspective of the sport. 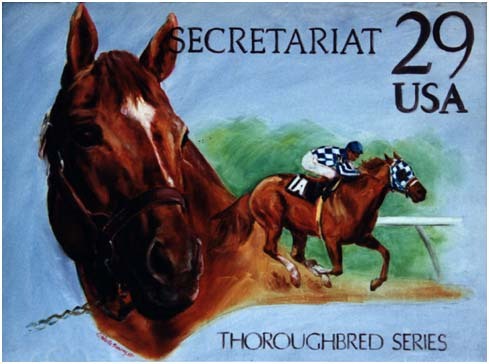 The first showing of her equine art came at a Del Mar yearling sale in 1983. This subsequently led to her meeting Kris Robillard, who owned a horse named Kris S. She became one of Celeste’s first important collectors. 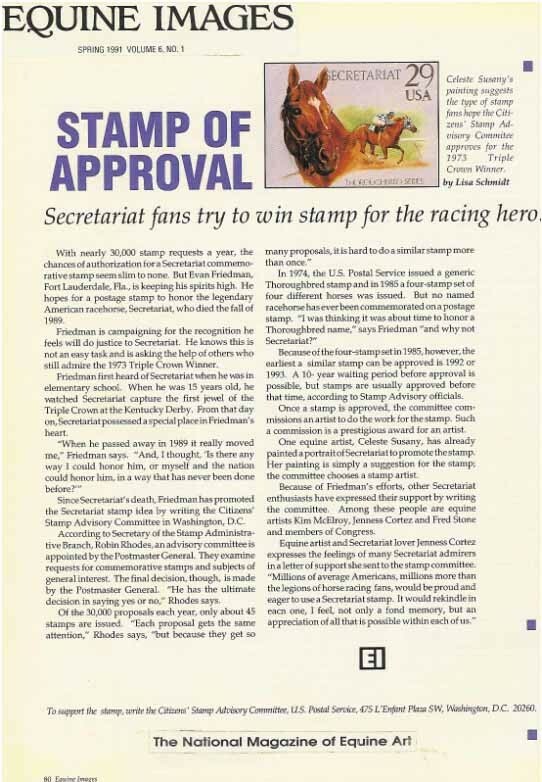 Contacts in Kentucky led to artwork for the Kentucky Derby in 1989, 1990, and 1996. That, in turn led to a series of Winner’s prints for the Derby, including last year’s winner, Giacamo. One of her best clients in Kentucky is Early Times. She has been doing the artwork that graces the bottle of the Early Times Mint Julep, the official drink of the Kentucky Derby, for the past seven years. Celeste has been exhibiting work in Saratoga annually since 1984. She has been doing artwork for the Saratoga Racecourse for the past eight years, as well as exhibiting her work on the track during the race meet. Although a major portion of Celeste’s work is privately owned, she continues to do commissions for many of the racetracks around the country and Canada. She received recognition as a top American artist in the book, Racing in Art, by John Fairley, a British collector.